Last analysis expected upwards movement, which would have been confirmed with a trend channel breach on the hourly chart. Price has moved sideways, and remains firmly within the channel. This wave count agrees with MACD. If upwards movement is within a third wave, then it should show an increase in upwards momentum beyond the end of minor wave 1. Because we have not seen that increase in upwards momentum yet (on the one to six hourly time frames) we probably have not seen the middle of the third wave. 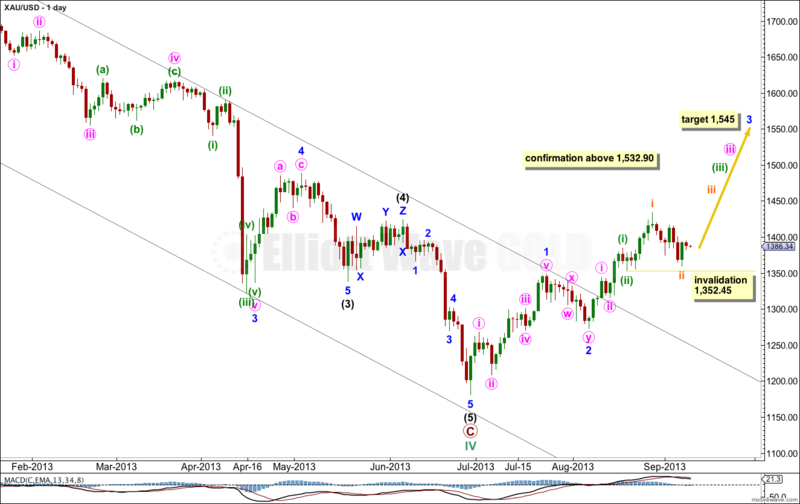 At 1,545 minor wave 3 would reach 1.618 the length of minor wave 1. Within minor wave 3 subminuette wave ii may not move beyond the start of subminuette wave i. 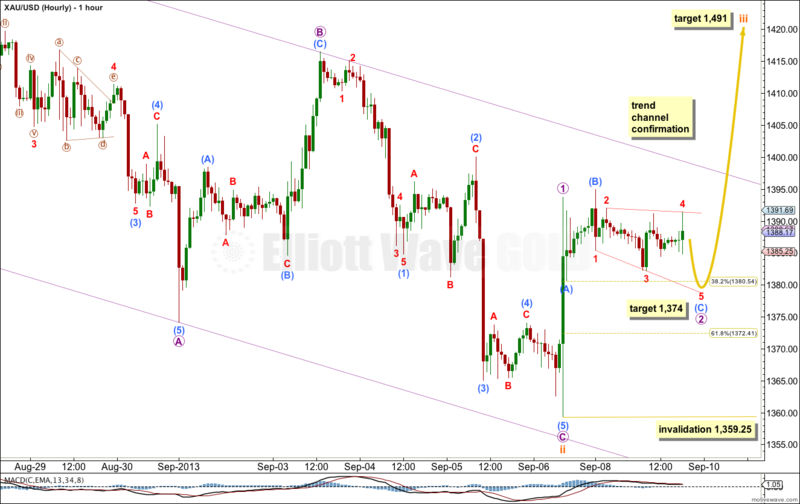 This wave count is invalidated at minute wave degree with movement below 1,352.45. Within subminuette wave iii micro wave 1 is complete and micro wave 2 is an incomplete flat correction. Within micro wave 2 submicro wave (B) is a 109% correction of submicro wave (A), so this is an expanded flat. Expanded flats normally have C waves which are 1.618 the length of their A waves. At 1,374 submicro wave (C) would reach 1.618 the length of submicro wave (A). Draw a parallel channel about subminuette wave ii. Draw the first trend line from the start of micro wave A to the end of micro wave B, then place a parallel copy upon the end of micro wave A. We need to see this channel breached to have confirmation that subminuette wave ii is over and subminuette wave iii is underway. When we have that breach I will have more confidence in calculated targets. Micro wave 2 may not move beyond the start of micro wave 1. This wave count is invalidated with movement below 1,359.25. If cycle wave a is unfolding as an impulse then recent upwards movement is primary wave 4 within the impulse. Primary wave 4 may not move into primary wave 1 price territory. This wave count is invalidated with movement above 1,532.90. Primary wave 4 is incomplete. This wave count is an alternate because there are no Fibonacci ratios at intermediate degree within primary wave 3 of cycle wave III. I have spent much time trying to see a better fit in terms of ratios which meets all EW rules for this wave count, but so far I cannot. This does not mean it does not exist! For this alternate wave count we need to see minor wave 3 within intermediate wave (C) as completed; there is not enough room for upwards movement if the third wave is extending. 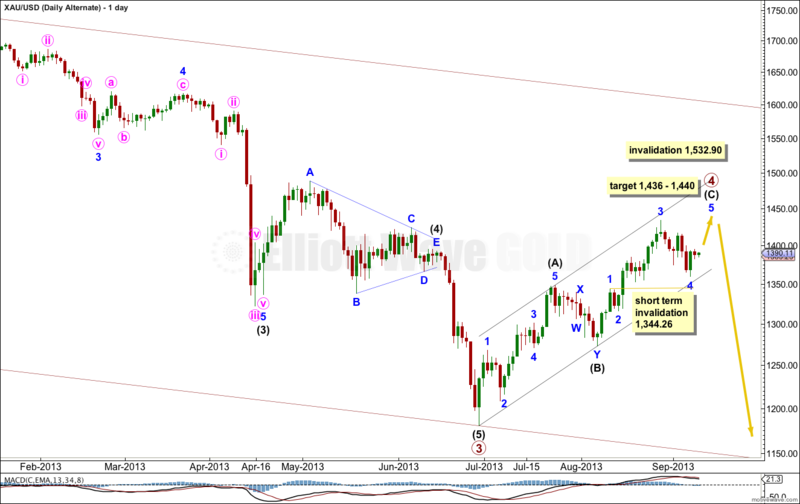 At 1,440 intermediate wave (C) would reach intermediate wave (A). At 1,436 minor wave 5 would reach equality with minor wave 3. This gives us a $4 target zone for one final upwards wave. Thereafter, the downwards trend should resume. There is no downwards invalidation point (beyond the short term) for this alternate.